While working in the oil fields in Kern County I noticed a lot of the single handed weldors had a neat little BBQ pit on the back of their rigs. Would really like to find someone that is making these or some hints and tips how to make my own. Design ideas welcome . . . pipe sizes, materials, etc . . . They appear to be basically a piece of pipe, two caps . . . Some seem to be a lot fancier than others . . . . I recently completed a basic welding class. At 53, learning to weld is somewhat of a challenge. I now have a very healthy respect for someone that can really weld well. I never realized how hard that "stack of dimes" was to come by. I can do alright with MIG . . . Stick ain't for "sissies" . . . TIG, well, thats pretty much one of those some day things . . .
My intention is to build some of those little pits as gifts for family members. Might say something that will be around a long time. Anyone got any info, suggestions, ie pipe size, componets to include, use caps for ends?, flat plate for ends? If you have any info that would help me construct one please PM me or post. 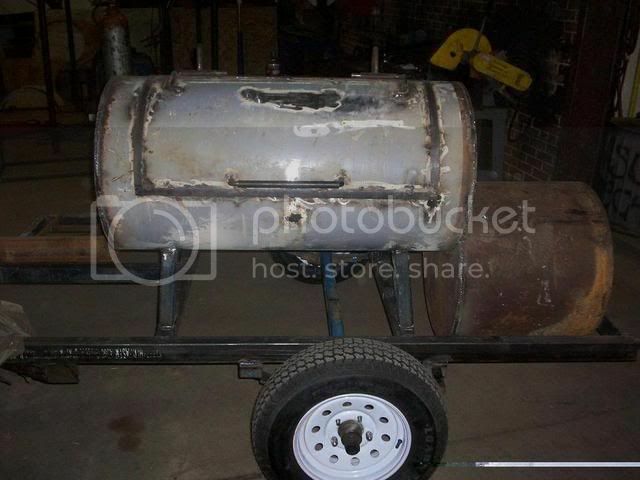 I'm really sick of seeing this Walmart Junk for small BBQ Pits . . . . I recently bought an all stainless steel "small" BBQ pit . . . . guess what, it came from China . . . beer cans were better made when I was a kid than this thing @ $185.00! Really want to build something that screams "I'm American Made & Will Last Forever" . . . . kind of like my SCAG Mower . . . no doubt when you look at it, you know it was "Made in America"
Please more pipeline BBQ pit info . . . . I have been unable to find anything on the net . . .